If you have a home in a beautiful setting how do you bring the outdoors in? Architecture can blend with nature. 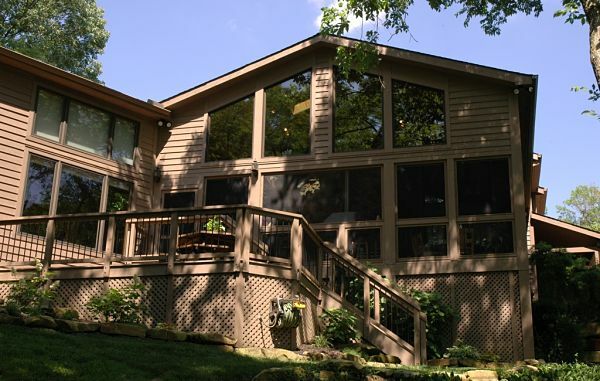 Our “Project Spotlight” showcases a two-story porch addition and deck that creates an outdoor living space with an unobstructed view of woodlands and a lake. The porch provides a sheltered place for cooking and entertaining, and augments the architecture of the home. 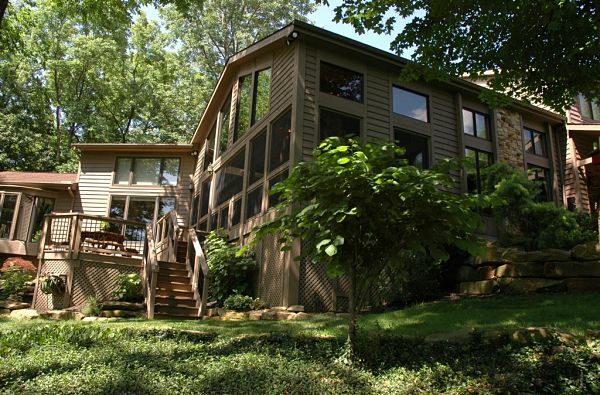 A two-story porch addition blends perfectly with the contemporary architecture of a home located in a woodland setting. The wall of windows provides an unobstructed view. 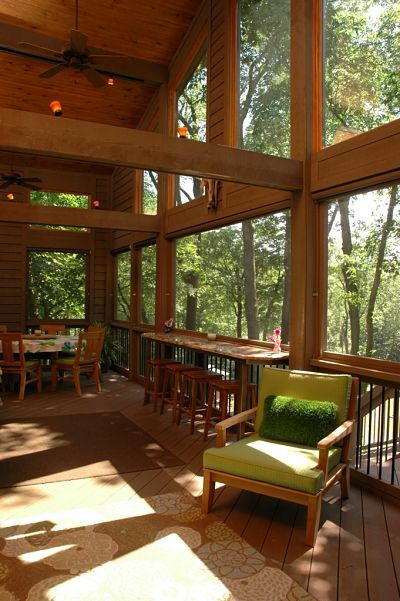 The porch opens onto a deck with additional outdoor seating and access to the yard, gardens and lake. The design of the porch should be open and airy to integrate the home with the natural surroundings. It should also blend with the architecture of the home. The design should provide for an unobstructed view of the property. A new cooking area placed within the porch should maintain the existing stonework of the chimney, which the homeowners wanted to incorporate into the design. The interior should be designed for family gatherings and entertaining with areas for seating, dining and viewing the gardens and lake. Existing deck materials would be reused to create an area for outdoor seating and dining and the stone chimney would become a decorative element within the interior of the porch. 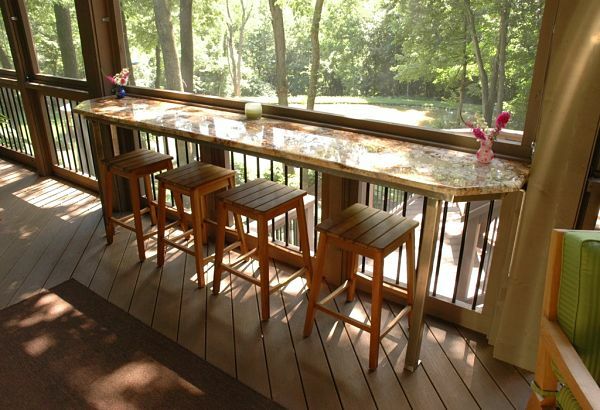 BEFORE: An elevated deck was used by the homeowners for outdoor cooking and entertaining. A canopy over the grill provided shelter for the cook. A stone chimney was a focal point on the deck and the owners wanted to incorporate this feature in the design of the porch addition and reuse deck material. 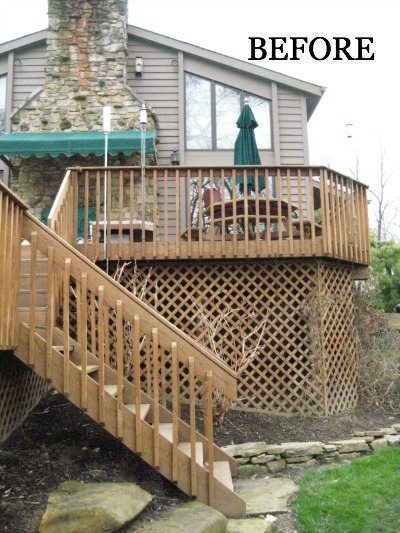 The deck and steep hazardous stairs did not comply with current building code. There were design and structural challenges in this project along with reusing materials and repurposing existing architectural elements. The existing foundation of the deck would not be able to support the new roof of the addition. Stairs from the main level of the deck to the lower tier were steep, hazardous and did not comply with current building code. The lower level of the deck was built away from the house on an angled wall on the exterior, creating a triangular gap. The stone chimney was treated as an independent element on the exterior wall of the house and was not integrated into the design of the deck. There would need to be a new design for the roof to comply with code and bear the weight of the addition. Problems related to wind sheer and racking could be caused by the structure’s height, volume and use of large windows. The old decking, which had been exposed to the elements, was no longer appropriate for the interior space. Ventilation would be needed for a grill, which now would be enclosed by the porch and outlets would be added for appliances in the cooking area. The addition would need to blend seamlessly with the architecture and exterior of the house. Seven new support columns were built within the deck and two more were built onto the exterior of the house to provide structural support for the new roof of the addition. The steep stairs were replaced with a staircase. The lower deck was enlarged, connecting it to the house. The enlarged deck complies with building code and blends with the home. New rails and lattice are attractive accents. A new staircase with handrails is safe and sturdy. 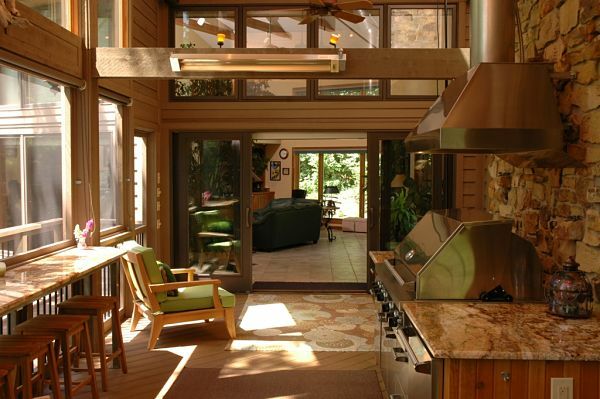 The grill area was redesigned with granite counters that blend with the stone chimney, now in the interior of the porch. A granite bar was added and placed where people could enjoy the view of the yard and lake while seated. An aesthetic feature of the porch was the addition of a contemporary railing system on the lower portion of the screens. This element adds interest to both the interior and exterior of the addition. 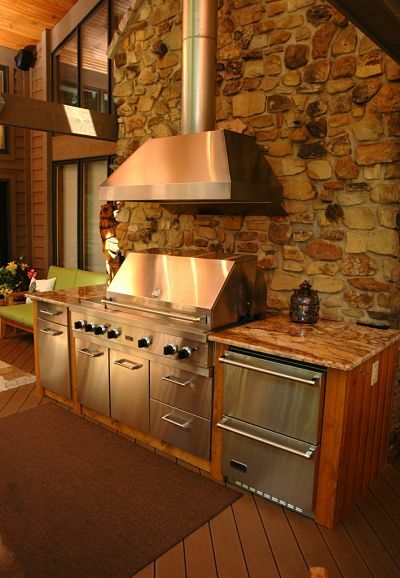 Granite counters were selected for the cooking area and bar to complement the stone chimney. Bar railings add architectural interest. Roof loads were placed at the mid-point of the structure. Oversize rafters and box headers placed at top plate and mid-wall heights were used to address the impact of wind. Interior structure of the porch addition. Rafters and headers add support and blend with the contemporary architecture of the home. New recycled decking, finished to match the stained trim, was installed on a diagonal to add visual interest to the space and match the contemporary styling of the home. New deck flooring on the interior was stained to match the trim. The new grill required a vented hood. A venting pipe was diverted at the top around the center beam of the new roof. A heat shield was installed between the chimney and the roof. The gap was covered with a panel edging the stone. Drawer refrigerator units are used to store beverages and matching stainless steel cabinets provide storage. Porch interior: Cooking area integrated with the stone chimney creates a focal point in the room. Trims and siding of the addition were matched to the house and border gardens were relatively undisturbed during construction. New windows and screens were designed to match the proportions of the existing home. 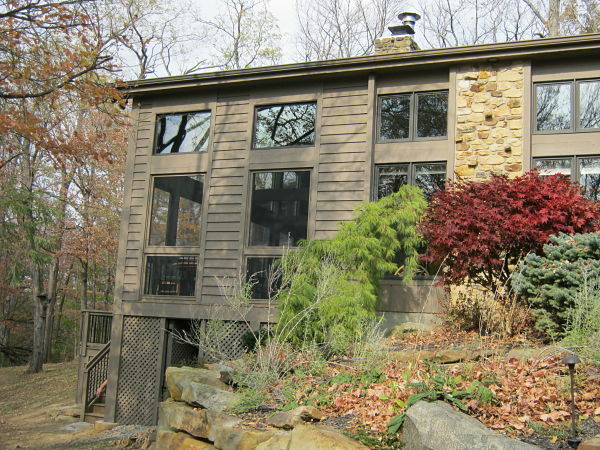 The architecture of the addition including siding, trims, windows and screens, augment the original design of the home.